Digestion unit with infrared technology. The quick alternative to the KJELDATHERM® digestion block. Tried and tested C. Gerhardt technology specifically designed for Kjeldahl digestion of a wide variety of samples with nitrogen content in the micro and macro range. Ideal for subsequent Kjeldahl distillation with the VAPODEST® distillation units. Also for use as a multifunctional, programmable hotplate for inorganic acid digestion. Infrared radiation ensures direct heating of the sample for short heating and cooling times. After digestion, the exhaust manifold, drip tray and sample frame are simply hooked into the multi-level console. This is convenient, safe and space-saving. 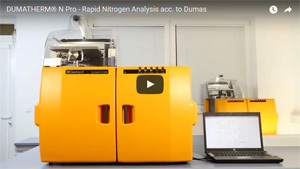 Direct heating of the sample prevents delay in boiling. Resulting acid fumes are effectively extracted by the exhaust manifold through the water jet pump provided or the powerful optional TURBOSOG suction station. 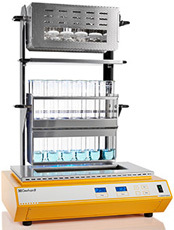 Various insert racks for 4, 6 or 12 digestion tubes with 100, 250, 400 or 800 ml volume mean TURBOTHERM can be used flexibly for digestion of a wide variety of sample types. All digestion tubes can then be inserted directly into the VAPODEST® distillation systems. The electronic time/output control enables rapid and trouble-free digestion of even difficult samples. Up to 9 energy/time programs can be saved and retrieved. Each program offers 9 heating levels with variable times and heating output. The running program can be adjusted manually at any time.